Virginia Bobcat Removal, Bobcat Trapping and Bobcat Control in VA. Millions of dollars are lost each year by Virginia farmers from livestock predation by bobcats and coyotes. Virginia Professional Wildlife Removal Services offers bobcats removal, bobcat control, bobcat trapping, bobcat capture, bobcat management and predator control to farmers throughout Virginia. It is important to understand that effective predator control is a year-round process – it is not the type of wildlife problem that can resolved with spot-treatment. To be truly effective it requires a comprehensive plan covering all twelve months of the year. Virginia Professional Wildlife Removal Services does not use, or recommend, poisons or M-44 cyanide guns for bobcats removal and predator control in Virginia. While effective, we believe they are far too dangerous to domestic pets and non-target animals that are found so commonly in Virginia. Our Virginia Wildlife Removal Company is constantly seeking to advance our education so that we may serve you better. We routinely provide bobcat removal and predator control throughout Central and Eastern Virginia – including Albemarle, Amelia, Goochland, Louisa, Orange, Barboursville, Fluvanna, Powhatan, Henrico and Hanover Counties, as well as the cities of Charlottesville and Richmond, and the towns of Mineral, Gordonsville, Earlysville, and Keswick. We can also travel to other areas of Virginia. Call us today and let us address your predator control needs. 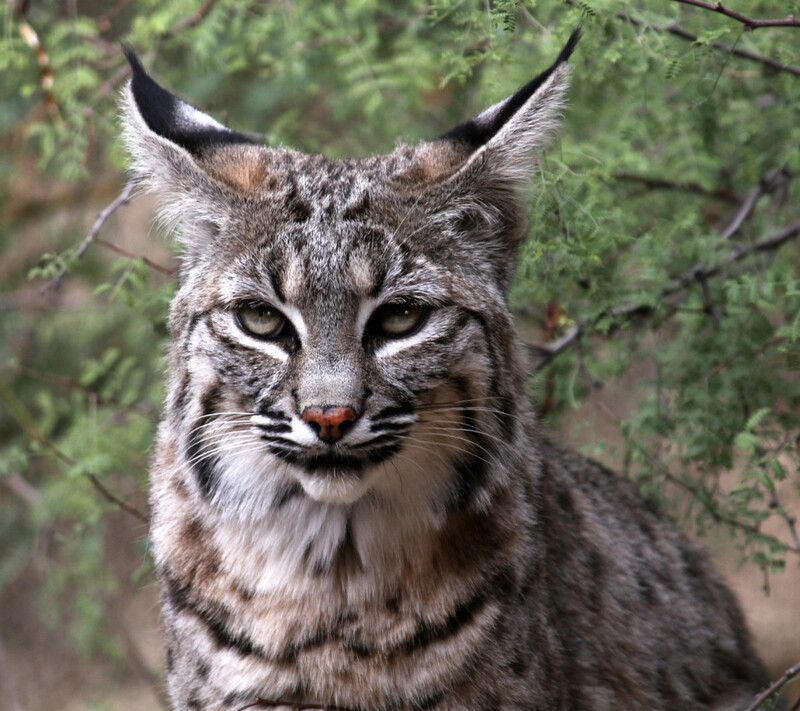 Bobcats are opportunistic predators, feeding on poultry, sheep, goats, house cats, small dogs, exotic birds and game animals, and, rarely, calves. Bobcats can easily kill domestic and wild turkeys, usually by climbing into their night roosts. In some areas, bobcats can prevent the successful introduction and establishment of wild turkeys or can deplete existing populations. usually open an area just behind the ribs and begin feeding on the viscera. Sometimes feeding starts at the neck, shoulders, or hindquarters. Bobcats and cougar leave clean-cut edges of tissue or bone while coyotes leave ragged edges where they feed. Bobcats bite the skull, neck, or throat of small prey like lambs, kids, or fawns, and leave claw marks on their sides, back, and shoulders. A single bite to the throat, just behind the victim’s jaws, leaves canine teeth marks 3/4 to 1 inch (2 to 2.5 cm) apart. Carcasses that are rabbit-size or smaller may be entirely consumed at one feeding. Bobcats may return several times to feed on large carcasses. Bobcats, like cougars, often attempt to cover unconsumed remains of kills by scratching leaves, dirt, or snow over them. Bobcats reach out about 15 inches (38 cm) in raking up debris to cover their kills, while cougars may reach out 24 inches (61 cm). Bobcats also leave signs at den sites. Young kittens attempt to cover their feces at their dens. Females with young kittens may mark prominent points around den sites with their feces. Adult bobcats leave conspicuous feces along frequently traveled rocky ridges or other trails. These are sometimes used as territorial markings at boundaries. hind feet. These marks are 10 to 12 inches (25 to 30 cm) long by 1/2 inch (1.25 cm) wide. We provide residential, commercial, and industrial animal removal, animal control, animal trapping, animal capture, pest control and wildlife management services throughout Virginia. Some of our service areas in Virginia include: Accomack County, Albemarle County, Alexandria County, Alleghany County, Amelia County, Amherst County, Appomattox County, Arlington County, Ashland, Augusta County, Barboursville, Bath County, Bedford County, Bland County, Bon Air, Botetourt County, Boyd Tavern, Brandermill, Brunswick County, Buchanan County, Buckingham County, Campbell County, Caroline County, Carroll County, Central VA, Charlotte County, Charlottesville, Chesapeake, Chester, Chesterfield County, Clarke County, Colonial Heights, Craig County, Culpeper County, Cumberland County , Dickenson County , Dinwiddie County, Earlysville, Elkton, Essex County, Fairfax County, Fauquier County, Ferncliff, Floyd County, Fluvanna County, Franklin County, Frederick County, Fredericksburg, Giles County, Glen Allen, Gloucester County, Goochland County, Gordonsville, Grayson County, Greene County, Greenville County, Gum Spring, Hadensville, Halifax County, Hampton, Hampton Roads, Hanover County, Harrisonburg, Henrico County, Henry County, Highland County, Isle of Wight County, James City County, Keswick, King & Queen County, King George County, King William County, Lake Anna, Lake Monticello, Lancaster County, Lee County, Loudoun County, Louisa County, Lunenburg County, Luray, Lynchburg, Madison County, Maidens, Manakin, Manakin-Sabot, Manassas County, Mathews County, Mechanicsville, Mecklenburg County, Middlesex County, Midlothian, Mineral, Montgomery County, Nelson County, New Kent County, Newport News, Norfolk, Northampton County, Northern VA, Northumberland County, Nottoway County, Oilville, Orange County, Page County, Palmyra, Patrick County, Petersburg, Pittsylvania County, Powhatan County, Prince Edward County, Prince George County, Prince William County, Pulaski County, Rappahannock County, Richmond, Richmond County, Roanoke County, Rockbridge County, Rockingham County, Rockville, Russell County, Salem, Sandy Hook, Scott County, Shannon Hill, Shenandoah County, Short Pump, Smyth County, Southampton County, Southwest VA, Spotsylvania County, Stafford County, Staunton, Suffolk, Surry County, Sussex County, Tazewell County, Tidewater VA, Troy, Virginia Beach, Warren County, Washington County, Waynesboro, Westmoreland County, Williamsburg, Wise County, Woodlake, Wythe County, York County, Yorktown, VA and the surrounding areas of Virginia. We are experts at bobcat removal and bobcat trapping in Virginia. If you have questions on Virginia bobcat removal, give us a call.